Marley is a pretty straight forward biography of Bob Marley’s life, from being born of a white man in St. Ann Parish in Jamaica to his final treatments for melanoma in the mountains of Germany. This documentary doesn’t take many risks when telling us about the life of Bob Marley, but it does manage to infuse the movie with Bob’s irrepressible spirit. Or maybe it’s just that Bob’s lyrical music is playing throughout making it seem so joyous and sad at the same time. Knowing that this great man who had so much energy and musical genius, who had such an impact on not only the world of music but on issues relating to the poor and violence in his country, died at a mere 36 years old seems so very wrong and so sad. 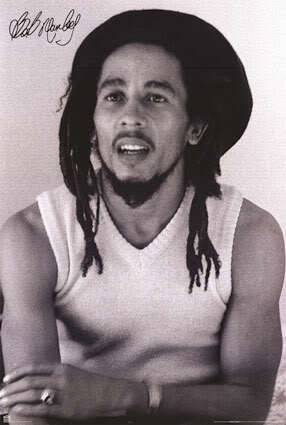 I couldn’t help loving Marley and don’t think it’s just because I love Bob Marley. I'm just passing through "blog hopping" and wanted to say hi! You have a lovely blog.